This is an annual, Big Beer, favorite of mine. I have it often at parties or large dinners to serve in a snifter after we eat. I even had my “Pils Light” drinking brother enjoy a snifter of this while smoking a cigar. This year, on December 6th our home school group had a St. Nicholas Party. Well, there was a no doubt on what I was going to bring for the dads, it had to be Samichlaus. After we had eaten several of us dads sat down with small snifters of Samichlaus. It was a big hit and quite appropriate for a St. Nicolas party. It pours a very rich dark amber with reddish hues. Don’t let the picture fool you I poured this very aggressively and got a very small soapy head. Normally this beer doesn’t produce any type of a head. This has a very unique nose. There are sweet caramel malts, ok, that’s not unusual but there is a very sweet fruity aroma, like cherries or something. It must have something to do with the alcohol since I know there is no fruit added to this beer. This is definitely a slow sipping beer. Sweet caramel malts upfront, smooth and almost creamy in the middle with a dry sweet finish. The flavor of this bier reminds me of a barley wine. There is also a nice warming effect from the alcohol. This beer is not a very smooth beer, well that’s not quite what I mean. It’s a dry beer; similar in characteristics to what you would describe “dry” as in a wine. This beer is currently at 57 degrees. I am going to use snifter in the palm of my hand to warm this up a little. Let’s see what this bier is really made of. 60 degrees and it is getting smoother. Not that it was ever harsh but it seems, “less dry”? and smoother now. 75 degrees, oh how smooth and that sweet almost cherry flavor is becoming more pronounced now. Cognac! That’s it! It just hit me that the sweet taste and barleywine flavors remind me of Cognac. The warm mouthfeel of this bier at 75 degrees triggered memories of sipping cognac in this same manner. That is why I have so many brandy snifters. I use to love warming up a snifter of Covousier VSOP cognac. It wasn’t until this bier reached 75 that it hit me. Sorry, we can now get back to the review. As it warms in temperature it’s a whole new bier experience. This is just phenomenal. This bier is incredibly smooth and rich, much more so now at this warmer temperature. 82 degrees now and it’s just, Simply Phenomenal. Luscious, is another word that comes to mind. I don’t know why I have not done this before? The warmth brings out all the best qualities of this bier. The tastiness of the caramel malts are really more pronounced now. The whole experience is a silky warmth that just makes you melt. 86 degrees, wow and it is still getting better. 87 degrees, I have two things; first of all I’m just astounded that any beer let alone a Dopplebock can taste this good at his temperature. Secondly I am really at a loss for words to describe this experience. I’m sure it will reach equilibrium soon and the temperature should level off shortly. 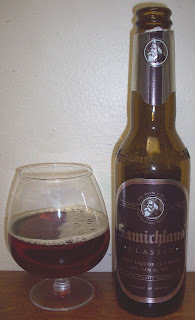 Plus since I shared the bottle with my son John (BierVlog) I’m running out of bier in my snifter. The bier is at 88 degrees now. I don’t think I can go any higher in temperature with only using the palm of my hand. This bier has the most exquisite mouthfeel. Those toasted caramel malts are just coating my mouth with absolutely no unpleasantness whatsoever. Well, the label states that this is "The Worlds Most Extraordinary Beverage". When at its best at 88 degrees I may have to agree with them. Wow, What an experience! This may be the most phenomenal beer experience I’ve ever had. Like a stated on the World Wide Stout review this needs a new category, a “Bier Liqueur”. At the warmer temperatures this was the most exquisitely tasting experience ever. Outstanding! I just don’t have the vocabulary to express how delightful this Samichlaus warming experience was. You really need to try this for yourself.